This month’s Fearless Fridays interview is with none other than my own coach and mentor, Kelly Roach. Kelly is a former NFL cheerleader and had a hugely successful career in sales and recruitment before she decided to start up on her own in order to create what she most valued in her life: freedom, fulfilment and financial abundance. There are so many valuable points that Kelly makes in this interview. She shares how she right away recognised the importance of having someone to guide her through the process and hired a coach a year before she even started her business; she talks about the importance of building a team so that you’re never alone as an entrepreneur; and she gives some powerful advice around showing up and doing the work to create a brand and an eco-system that will last for years – even when you’re not always seeing the results right away! I REALLY recommend that you watch the full interview below (and keep an eye out for Kelly’s little entrepreneur in the making, Madison) and you can also read on for the highlights below. Kelly Roach is the host of the top-rated podcast Unstoppable Success Radio, an International best-selling author, and the CEO of Kelly Roach Coaching. 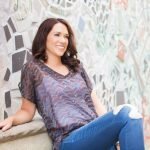 As a former NFL Cheerleader and Fortune 500 Executive where she was promoted 7 times in 8 years, Kelly brings a powerful combination of proven and profitable business growth strategies coupled with the mindset, wellness and productivity practices required to help entrepreneurs build a profitable business around a life they absolutely love. Kelly’s passion and purpose is in helping entrepreneurs around the world achieve exponential profit, sales and income growth. I started off doing sales and recruiting for a Fortune 500 firm, and really worked my way up the corporate ladder extremely quickly. I was promoted seven times in eight years. I became the youngest Senior Vice President in the company, and I was managing 17 branches. I had a team of 100 people. Really what I was doing was a lot of what I do today, just in a different format. I was responsible for driving sales growth. My whole job was teaching, training, coaching, and developing people to one, believe in themselves, two, have the confidence, and three have the skills to go out and sell and market and build their business. 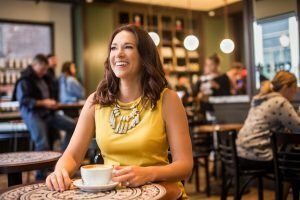 When I started my own business, I really took the best of what I loved so much and was so passionate about in that field and really channelled my energy into something that I felt was much more impactful and fulfilling to make a difference in the world, which is focusing on small business owners. For me, it’s very fulfilling when a business owner says, “I was able to pay off my debt,” “I was able to quit my job,” “I was able to pay to take my family on vacation.” One of my favourite success stories ever was when a client told me that after their first six months working with me it was the first time ever that they got to pay for all of their Christmas presents with cash. It’s little things like that, that’s why I decided to do what I do. I know today that every business owner that I help, it’s a family that I’m touching, and it’s a relationship that I’m reinforcing because of that person now being able to have the freedom and flexibility to put their family first, which is my most important premise in my business. It doesn’t matter where you are today, whether that’s important to you or not, at some point it will be. If you start ahead, and you start working on that when you don’t need it, which is exactly what I did. I wasn’t pregnant with Madison yet. I didn’t have a daughter, but I was planning ahead for that when I started my business because I knew that by the time she got to be the age that she was interacting and kind of knew what was happening in life that I wanted to be a really present mom. When you plan ahead and you work towards your dream, and you set goals for yourself, you can make anything possible. Kelly realized that her core values are freedom, fulfilment and financial abundance. The biggest thing was honestly quality of life. Getting seven promotions in eight years was my goal – and I really made the decision to go in early and stay late, and work on the weekends, I didn’t have to do that. The corporate world is a completely different beast than the entrepreneurial world: when you’re building your own business you build a team and you keep adding to that team, so you’re able to leverage your time. I don’t work any more in my business today than I did when I was a start-up, and we’ve grown obviously substantially. But the difference is in the corporate world every time you get a promotion, every time you take on more, you’re expected to just work more and more and more and more hours. There’s no correlation. You’re not actually building something that’s scalable, or that will allow you to then later reap the benefit and the reward of that. To me, that was a very short-term way of operating. I thought, “This doesn’t even make sense. I’m not actually creating something that down the road I’m going to be able to leverage. I can keep getting promoted, but I keep having less and less time. Even though I’m making more money, I’m not accomplishing these things.” It was really just coming to a precipice of realizing that my three values were freedom, fulfilment, and financial abundance. I really had to do some reflection and I recognized that that is not available or possible in a corporate environment, especially in a Fortune 500 firm. You really can’t expect that in a job. I think you have to take responsibility to go out and create that. Now what I will say is that I worked very, very hard in my own business to make sure that my team members are able to accomplish those three things, freedom, financial abundance, and fulfilment in their work. I do think it’s possible, but I think it’s very rare because you would have to have a business owner or a business leader that has that mindset of wanting to create that. In most companies or corporations, that’s not obviously, that’s not a priority. That’s not something that’s on their radar to create for people. I think the hardest thing for me to learn as an entrepreneur is a willingness to fail publicly. That is very, very difficult, especially when you’re high D, type A, high achiever, which I know probably you are and so many other people listening. It’s very difficult to fail publicly, so that’s what holds most entrepreneurs back from achieving true success because unfortunately now with everything being done on social, you’re going to win or lose in front of everyone. You’re on a grand stage with everything that you do. I mean, I’ve had completely failed launches where I literally sold nothing. I’ve had webinars where I’ve had no one show up. I’ve had every failure that you could imagine as an entrepreneur. I think the other thing is that in every other facet of life we understand that you’ll have to practice and practice and work towards things for years, but then I think in entrepreneurship we expect that the first time we do something it’s going to be this magically perfect result. Then when it’s not, we think, “Oh, that didn’t work, let me go focus over here” – which is the worst thing you can possibly do! My biggest message of 2018 for entrepreneurs is play the long game and you will be the only person leading in your industry. Everyone’s playing a short game right now, so if you’re the person that’s thinking about 5, 10, 15 years from now, the decisions that you are making will be 100 times more powerful than the decisions that your peers are making. Literally, the cream always rises to the top. You may feel like, “oh my gosh, I’m struggling, I’m scraping by right now, I’m barely able to get a client” – but if you’re making good decisions every single day, that will ultimately translate into you being the leader in your industry. I’ve had lots of coaches and mentors myself. I always tell the story of the best decision I ever made when I started my business, which was that I started business coaching with Ali Brown a year before I started my business. That is how much I believe in coaching, in the power of coaching. I realized I could cut 5 to 10 years off just by doing it the right way the first time instead of trying to make it up as I go. I had a background in business growth strategy and sales, and I still knew that there were immense differences between, for example running an online business and running an offline business. I can’t even convey the value in finding someone who is where you want to be and investing in coaching and training with them. I still to this day utilize so many of the things that I learned from Ali Brown in 2012. I hear from people all the time that as an entrepreneur, you feel like you’re on an island, you feel lonely. Well, if you build a team and you get a coach, then you’re in a community and you have people who are rallied around you, all working towards a common goal. I never feel alone. I can say that I never feel alone. No one needs to feel alone. But the decisions that you make will determine if you’re on an island, or if you’re in the centre of this community with people having their arms wrapped around you. I started off with a VA for one hour a week, and that was the start of my team. I think it’s very intimidating for people to hear ‘team’ because they’re thinking of investing $50,000 in a full-time person (or pounds, or whatever!). You know what I mean? Yes, that is the ideal, and that’s where you want to get to eventually, but that’s not where you’re going to start; that’s not where anybody starts. Just get started with some small incremental amount of help to allow you to focus on the right things so that you’re not getting dragged down into the things where you should not be spending your time and energy on. Everything. I mean, I would say I’m at a stage now where years of making good decisions, years of planning in advance have come to fruition. The ability to have my husband home full time with my daughter, which was the number one most important thing in my life – I retired my husband so that Madison never had to go into day care – that’s my proudest accomplishment. Being completely debt free. Last year we paid off our house. We have no debt of any kind. Getting to take a lot of family vacations, spend quality time together, put my family first. Last summer, I took every Friday off. This summer, we’re doing a lot more trips, because Madison is older and we can travel now. I just think that after a period of years of doing the right thing, and doing the right thing, and doing the right thing, even when I wasn’t getting the results from it, it comes full circle. My biggest piece of advice for new entrepreneurs today is to focus on engagement-based video. That was not available when I started my business. There was no such thing as live streaming, and Instagram wasn’t even a thing at that point. I would say that is the best business breakthrough that’s happened in the past decade, and it’s free. If you’re a new entrepreneur starting today, you need to make your phone your best friend. You need to make your phone your best friend, and get on camera. That is the biggest piece of advice I have for new entrepreneurs. It wasn’t available to me. Now with my second business that I’m just starting, everything we’re doing is engagement-based video: we’re live streaming every week, we’re doing Boomerangs, we’re doing stories…. And we’re seeing our audience grow faster there than my audience is growing in my coaching company. It’s because we’re leveraging the tools and technologies that are available today that weren’t available when I started my first business. Find out more about Kelly at Kelly Roach International on Facebook and you can also follow her on Twitter and Instagram.